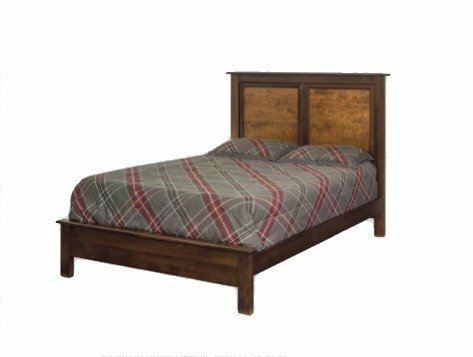 Versatile and positively rustic, the Amish Bayview Panel Bed brings warmth and natural beauty to your bedroom furniture collection. The rich, paneled headboard showcases the solid wood you select and offers a focal point that is sure to delight. Rustic style furniture like the Bayview Panel Bed incorporates natural elements and textured surfaces to add to its inviting design. The detail in the panel headboard and footboard bring out the quality of the solid wood you select. Let relaxation and warmth overtake you as you enter your bedroom with the Amish Bayview Panel Bed the central focus of the room. With your bed being a cherished and personal piece of furniture, the Bayview provides the very best in rustic style. Handcrafted bed panels will soothe you as the supportive rail and slat system of this solid wood bed offer the comfort and support you're looking for. Handcrafted for your home in an Amish woodshop in Ohio, you can trust that each design is built, tested and designed to offer the most durable construction. The Bayview is an Amish made bed that will stay in your family for generations and will not break down due to wear over the years. These trusted Amish woodworkers create exquisite solid wood furniture using generation-old techniques combined with state-of-the-art-woodworking equipment. Browse more of the incredible Barkman Collection for all areas of your home. Select the size for this rustic bed as well as the wood and stain you like best.